We’re surrounded with news and rumours all day, every day about the rich and famous, from politicians to the royal family to pop stars and reality TV personalities. But what about the other rich among us? What about those who came to riches through the wildest of luck—winning the Powerball lottery? Most Powerball lotto winners choose to stay anonymous, or at least as anonymous as possible. While this might be a wise choice, it’s not very exciting for those of us standing on the sidelines. Those who do come out into the limelight, though, just go to show us that when it comes to the lottery, truly anybody can be a winner. We’ve profiled some of the biggest US lotto Powerball winners in history, sharing everything there is to know about who they are, how they won, how much they won, and, most importantly, how they spent their prize. The winners of the $1.586 jackpot were determined on the January 13, 2016, draw of Powerball. 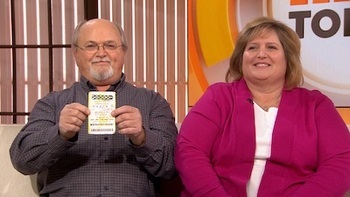 The winning tickets belonged to Munford, Tennessee, couple John and Lisa Robinson; Chino Hills, California, couple Marvin and Mae Acosta; and Melbourne Beach, Florida, residents David Kaltshmidt and Maureen Smith. The Robinson couple, as well as partners Kalthschidt and Smith, each took home a lump-sum payment of $328.8 million. It was not revealed whether the Acostas opted for the annuity payment or lump-sum payment of their share in the jackpot. As they were claiming their windfall, the Robinsons told the press that they will not make any sudden or major changes in their family's lifestyle. John even said he would keep his job as a maintenance distribution worker, while Lisa stated she would continue working in a dermatologist's office. The couple added that they would continue living in their one-story house in Munford. In 2018, however, the Robinsons must have suddenly realized how much money they were actually sitting on because they both quit their jobs and moved their family to a luxurious mansion in an undisclosed location, complete with 10 bedrooms and 8 bathrooms! They also bought the neighbouring 320 acres of land, which includes a lake. Kaltschmidt and Smith kept a more modest life than their co-winners. The Florida couple were still living in their old house in 2017, but Smith did reward herself with a gold-painted Tesla Model S amounting to $90,000. As for the whereabouts of the Acostas after their big win, they have been kept under wraps. Mother of two and hospital worker Mavis Wanczyk scored $758.7 million, or $336 million after taxes, in the August 23, 2017, Powerball draw, making her worth more than Kim Kardashian herself (who has a net worth of $175 million, if you were curious). It’s the second-largest jackpot in United States history and the largest jackpot to ever be won by a single ticket. Talk about lucky. “I had a pipedream and my pipedream has finally come true,” 53-year-old Mavis told reporters when she came forward to claim her winnings. Immediately after realising she was a winner, Mavis quit her job at Mercy Medical Center, a hospital in Springfield, where she had worked for over 32 years. “I’ve called and I’ve told them and I will not be coming back,” she said, with the same delighted grin we’d all have if we’d gotten to do the same. “My numbers were actually kind of random,” Mavis admitted. The winning numbers—which were 6, 7, 16, 23, 26, and Powerball number 4—were based off of family’s birthdays and Mavis’s personal lucky number, 4. It just goes to show that you should never give up on your lucky number. So what has she done with the winnings since then? That’s for Mavis to know and the rest of us to wonder about. Last we officially heard of her, she was planning on “hiding in her bed.” Well, we hope it’s at least a bed with very lush bedding, fitting for one of the richest women in America. 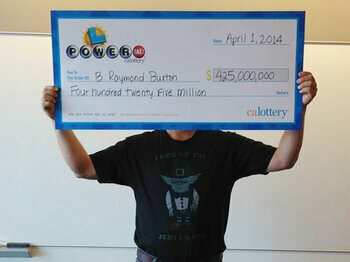 55-year-old B. Raymond Buxton pulled the ultimate Dad joke when he claimed his massive Powerball winnings on April Fool’s Day, wearing a shirt that sported a framed picture of Yoda above the words, “Luck of the Jedi I have”. Corny, maybe, but who are we to judge? Raymond kept as low a profile as possible by concealing his first name and covering his face with the oversized spoof check in all photographs. The newly minted millionaire-jokester took home $425 million in the February 2014 Powerball jackpot. Raymond has his appetite to thank for his new riches: He’d already bought one ticket for the draw but decided to purchase a second one—the winning ticket—during a lunch-break for a sandwich at a Chevron gas station. Since he was already retired from his job in the electronics industry, B. Raymond couldn’t dramatically quit his job. Instead, he said that he planned on using the money to travel and go on a road trip with his family, and set up a charity foundation focused on paediatric health, child hunger, and education. 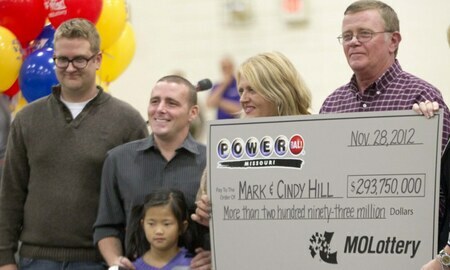 Missouri couple Mark and Cindy Hill—or The Hillionaires, as they became known—won half of the $587.5 million Powerball jackpot in November 2012. The Hills have four children: Jason, Cody, and Jarod, who are all already out of the house, and 6-year-old Jaiden, who was adopted from China. The family says they spent $10 on five tickets with random numbers. The winning ticket, with numbers 5, 23, 16, 22, 29, and Powerball 6, scored them a post-tax lump sum of $136.5 million. The family insisted that their wealth wouldn’t change them or make them forget their youth, but Cindy joked that it would be “a very good Christmas” and Jaiden declared that she wants “a pony.” Mark and Cindy were sceptical about the pony, but did say they were thinking of using some of the money to travel to China and get Jaiden a new little brother or sister. The “Hillionaires” said they wanted to give as much of their winnings to charity and helping others out as possible, mostly through setting up college scholarship funds and uplifting Mark’s hometown, Camden Point. Mark quit his job as a mechanic within hours after his wife called him to break the news. Cindy, who was previously unemployed and job hunting, said she had no more plans to continue looking for work choosing instead to focus on Jaiden and any future little Hills. 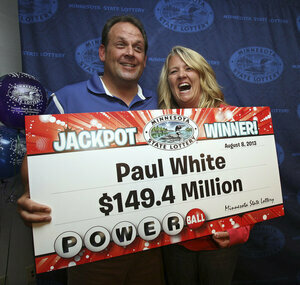 45-year-old father of two Paul White had been playing the Powerball for years and boasted about how he’d one day win so often that it had become a family joke. But in August 2013, on the night of the draw that won him $149.4 million—his share of a $448 million Powerball jackpot, one of the largest in history—he’d actually forgotten to buy a ticket. The stars must have been aligned in his favour, though, because he remembered in the nick of time and bought five tickets at the last moment. One of those tickets sported the winning numbers 5, 25, 30, 58, 59, and a Powerball of 32. What Can We Learn from the Biggest Powerball Winners? The lottery is the great equaliser: Whoever you are and whatever your story, we all stand an equal chance at scoring big. As these lucky winners show us, anyone can have their life turned upside down in the blink of an eye. So, it pays to be prepared—and to never stop dreaming.